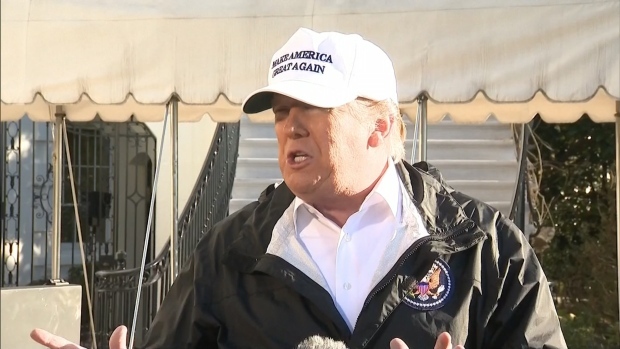 President Donald Trump flew to Texas Thursday to tour the southern border and make the case for his proposed border wall. This comes as the federal government entered its 20th day of a partial shutdown. President Trump has refused to sign any bill that doesn’t include $5.7 billion in funding for the border wall. President Donald Trump threatened on Thursday to declare a national emergency to circumvent Congress if he can't reach a deal with Democrats to fund his promised border wall. He headed to the U.S.-Mexico border to draw further attention to his case after negotiations with lawmakers blew up. 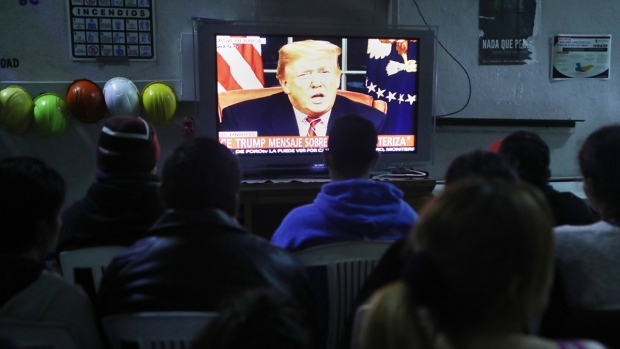 President Donald Trump said Thursday he is likely to declare a national emergency to pay for his long-sought border wall after negotiations with Democrats broke down over the government shutdown. Trump insisted as he left Washington that there are "a tremendous amount of funds" available to build the wall if he declares a national emergency and claimed, incorrectly, that he never campaigned on Mexico paying for the wall directly. His campaign released a detailed plan that outlined how the Mexican government could make "a one-time payment of $5-10 billion" for the wall. Asked about an NBC News report that a steel border wall prototype could be cut through with a saw, Trump claimed that it was "designed by a previous administration." He said the "wall we'd be doing would be very, very hard to penetrate." Trump also insisted he doesn't have temper tantrums, as Democrats said he did at their meeting Wednesday, and claimed China, Trump's major trade adversary, is "far more honorable" than House Speaker Nancy Pelosi and Senate Democratic leader Chuck Schumer. In McAllen, Texas, Trump visited a border patrol station for a roundtable discussion on immigration and border security and a briefing. But he has expressed his own doubts that his appearance and remarks will change any minds as he seeks money for the wall that's been his signature promise since his presidential campaign. He then toured a section of the U.S.-Mexico border as he continued to bolster his case for spending billions on a wall. Standing along the Rio Grande, the president said "a lot of the crime in our country is caused by what's coming through here." A law enforcement officer told Trump during his tour that a greater percentage of apprehensions in recent weeks have involved people from places other than Mexico and Central America. He cited people from Pakistan, China and India as specific examples. Trump told reporters, "So they apprehended people from the Middle East and they do it all the time." "Whether it's steel or concrete, you don't care," Trump said. "We need a barrier." Several hundred protesters were chanting and waving signs opposing a border wall next to the South Texas airport where Trump was set to arrive. Across the street, a smaller group of protesters shouted back, chanting, "Build that wall!" At least two protesters were arrested, according to Telemundo 40. 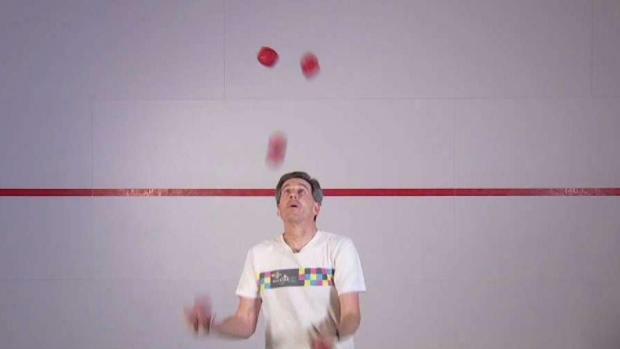 "I just go to the gym and juggle. Just a way to escape everything," Barry Goldmeier said. He's one of thousands of government employees furloughed during the shutdown. News4's Shomari Stone spoke to a therapist about other ways furloughed workers can cope with the stress. Meanwhile, federal workers in Washington Thursday denounced Trump at a rally with congressional Democrats, demanding he reopen the government so they can get back to work and receive their paychecks. Trump tweeted Thursday that he is canceling his upcoming trip to the World Economic Forum in Davos, Switzerland, because of the partial government shutdown. Several Cabinet members are still scheduled to attend the event, which attracts business and political elite. Pelosi fired back in a press conference Thursday, accusing the president of engaging in political games to fire up his base. Schumer said Trump slammed his hand on the table. But Trump, who handed out candy at the start of the meeting, disputed that characterization. He said he "didn't smash the table" but "should have." Trump also went to Capitol Hill Wednesday, seeking to soothe jittery Republican lawmakers. He left a Republican lunch boasting of "a very, very unified party," but GOP senators have been publicly uneasy as the standoff ripples across the lives of Americans and interrupts the economy. During the lunch, Trump discussed the possibility of a sweeping immigration compromise with Democrats to protect some immigrants from deportation but provided no clear strategy or timeline for resolving the standoff, according to senators in the private session. GOP unity was tested when the House passed a bipartisan spending bill, 240-188, to reopen one shuttered department, Treasury, to ensure that tax refunds and other financial services continue. Eight Republicans joined Democrats in voting, defying the plea to stick with the White House. There was growing concern about the toll the shutdown is taking on everyday Americans, including disruptions in payments to farmers and trouble for home buyers who are seeking government-backed mortgage loans — "serious stuff," according to Sen. John Thune of South Dakota, the No. 2 Senate Republican. Associated Press writers Jill Colvin, Colleen Long, Alan Fram, Deb Riechmann, Zeke Miller and Nomaan Merchant contributed to this report.